Ken Takashi Horii gives a gallery talk on his work in the recent “Transformations” exhibition. The Jewett Art Gallery is the teaching gallery of the Art Department at Wellesley College. The gallery hosts about seven exhibits annually which are generated by faculty on campus for teaching purposes and for exhibits of student work. The Sculpture Court, located on the third floor of the Jewett Arts Center also provides an additional space for exhibits throughout the year. The gallery aims to provide students at Wellesley College as well as the public a behind-the-scenes look at the process of running an art gallery. Student exhibitions in the gallery allow students to have a direct, hands-on experience curating, installing, and viewing their works within the context of a professional gallery setting. This is a unique experience for studio art students at the college level which gives insight to bringing their artwork beyond the classroom. Read student blog posts on their experience working in the gallery here. At the same time, this blog also provides a forum for discussion and dialogue related to ideas, art works, and artists in our exhibitions. Follow us on Facebook, or view more images by visiting our Flickr page. To receive exhibition announcements, become a fan on our Facebook page. The gallery is located in the Jewett Arts Center on the campus of Wellesley College. The Jewett Arts Center is the large concrete building adjacent to the outdoor plaza of the Davis Museum, and is part of the Academic Quad on campus. From the Rt 135 entrance to the college, walk down the main college road where you will pass the parking facility followed by the Lulu Chow Wang Campus Center on your right. A few feet past the campus center, you will see a large brick building (The Davis Museum) and small parking lot on the corner on your right. Walk up to the top of the parking lot and take a right, where you will enter the outdoor plaza of the Davis Museum. The Jewett Art Center is the large concrete building on your left, the Davis Museum is on your right. Take a right and walk underneath the Jewett Arts Center, walk up the steps, and then turn around 180 degrees and take the steps to the front entrance of the Jewett Ars Center. After you enter the building, you will see the gallery right in front of you. 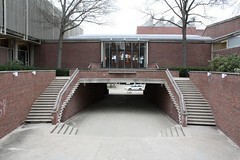 Front entrance of the Jewett Arts Center on the Wellesley College campus. Visitor Parking is free in the parking facility located at the Rt. 135 entrance to the college. When you enter the college at Rt. 135, take your first right which will lead you right into the parking garage. To submit work to be considered for the gallery, email the following to Gallery Director Candice Ivy. Be sure to attach all text documents as a PDF or Microsoft Word document. 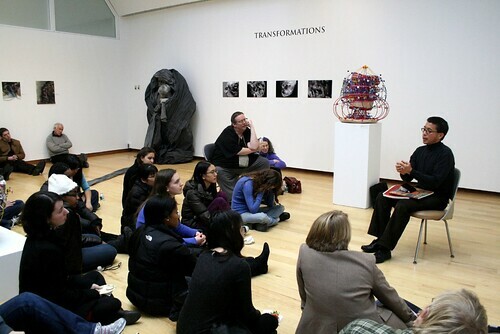 Please note that the gallery aims to exhibit works which can connect with and highlight the intellectual and cultural diversity of the academic programs at Wellesley College. Please include me on your email list. I’m an artist who writes for Art New England.